To fully envision the entire journey that Ruth endured as she consistently displayed her faithfulness, please read the FULL book of Ruth. Although the above scripture is only a tiny portion of the book, it’s magnitude in significance to our entire organization is phenomenal! The scripture tells the story of a woman named Ruth, who absolutely loved the Lord. Her love for God shined through her entire journey as she experienced the loss of her husband. But she loved her husband, and she also loved his family very much, particularly his mother, which was Ruth’s mother-in-law, Naomi. Well, as the story goes…..Naomi, her husband, and their 2 sons left their hometown of Bethlehem in Judah during a famine and moved to a country called Moab. After some time there, Naomi’s husband died, and she was only left with her 2 sons. Eventually, her 2 sons both met women while they were living in Moab and they married those women, one named Ruth and the other was named Orpah. After about 10 years, both of the sons also died, and Naomi was only left with her 2 daughters-in-law, Ruth and Orpah. Well after her husband and both sons had passed away, Naomi gathered up her 2 daughters-in-law and began on their voyage back to her hometown because she had heard that the Lord had visited there and was pleased with His people so He gave them bread. After a short while on the road, Naomi turned to her 2 daughters-in-law and told them to go back to their own hometown in Moab and live with their own mothers, so that perhaps God would bless them with a new home and new husbands. 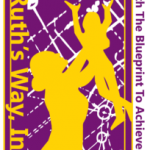 Ruth’s journey was a lucid depiction of her virtuous spirit, which was full of great love, humility, and respect; and she cherished a value system which embraced family, friendship, and faithfulness! These are the very values and morals that our entire agency stands firmly upon. More importantly, this is the value system that we encourage and teach our young ladies the art of embracing so that the VIRTUOUS YOUNG LADY within them can finally shine through!